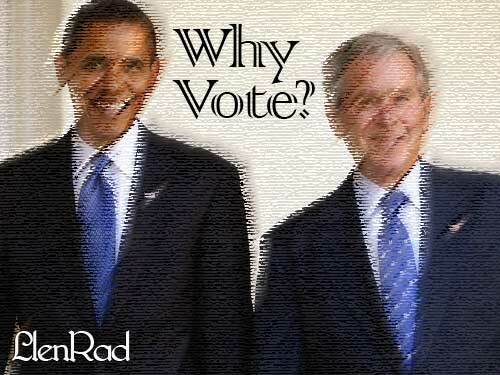 Home › Blog › The case against Voting Why you shouldn’t vote in November. I wonder if people have put any real thought into what voting is and why you should or shouldn’t be doing it this year. Isn’t insanity doing the same thing over and over and expecting a different result? I remember when Sean “P-Diddy/Puff Daddy” Combs started the VOTE or DIE campaign. At that time it was interesting to me. The premise was so many people died just for the right to vote. At least that’s the way I took it. I actually bought one of those T-Shirts and was all about the cause. It seemed to make sense to me. I remembered wearing it to a NFL game and having all types of people stop me and ask me about the shirt. It definitely got attention so I guess the promotion worked even though Bush still won. As time passed I began to notice what I thought I was participating in wasn’t that at all. I had watched Al Gore and John Kerry both basically “give up” to Bush when all the voters were crying foul. Everyone was all pissed off saying that George Bush stole the elections and it turned out the voters were more pissed off than the candidates themselves. Both Gore and Kerry basically rolled over and then they had the audacity to come back selling us GLOBAL WARMING? I’m like WTF? In this election season the early excitement was all about Ron Paul early as people came out in droves to support him running as a Republican. Many people even hoped that he would BUCK the system and run as an INDEPENDENT if he didn’t get the Republican nomination. It turned out he was just milking his supporters for cash and really just made a bunch of speeches. Once again the people voted and the people were screwed. He didn’t even get awarded the primaries that the Republicans stole from him. Watch he won’t run for Governor of Texas either sorry Ron Paul supporters gotta call a spade a spade. So I began to wonder. Is there a point to voting for the president? What difference would it make in our lives if we did or didn’t vote? Don’t these politicians just do whatever the hell they want to anyway? Seriously. 1. It’s the most Peaceful Protest. The safest and most peaceful way to protest an immoral and illegal system is to restrict your vote from it. People are not aware of the concept of quorum which means that if too few people vote then the clowns who claim to represent the people have to step down. It’s like a bumper sticker I have seen which is hilarious, “Don’ t Vote It only encourages the bastards”. 2. Your vote doesn’t count. Everywhere you look in the news there is more restrictions being passed to keep people from voting. Pushed by one party and NOT STOPPED by the other. Meanwhile NO ONE is given a GUARANTEE that their vote will be counted. Then people have to ignore the fact that the ELECTORAL COLLEGE really does the presidential voting. It’s all an arbitrary process that enables people lke Kathryn Harriss to rule over good decent people. With one flick of a pen boom your vote is toast. 3. They get to know even more about you. In 2004 I contributed some money to the Barack Obama Campaign and man was I surprised to see that it was public information. The government also gets to know how you VOTE and if you are supporting the party that is in power or not. Obviously the top supporters of the president are his billionaire financial bundlers who are literally above the law. So does it f0llow that the further away you are from these guys the more you are beneath the law? If protesting these guys makes you a terrorist does voting against them make you a target? 4. If voting really changed things it would be illegal. Internet censorship bills like SOPA and PIPA are proof of that. The things that work to encourage real change for people are always outlawed and made illegal. Example going on strike is illegal based on what job and where you are. Protesters are now labeled terrorists and beat like demons for stepping off of the sidewalk. The truth is no change in this country regarding rights or liberties has ever been made by voting. Some people like Rosa Parks took it upon themselves to do more and that MORE is what is needed today. PS: This article is based on the idea of voting in presidential elections. I do think everyone should get involved and vote locally however voting alone is not and has never been enough. What more needs to be done? What more can you do? people are praying with all their might today that the lesser of two evils will win. I am praying 2 but 4 this: may peace prevail on earth. Here we go again: Ohio Election board mails out the wrong date to voters. They don’t want you to vote. 1000 black people kicked off voter roles in system “glitch”. Uh Oh Voting problems in swing states. ROBERT BRYCE has noticed the same trend Americans are Opting out of Voting. PA voting Machine turns votes for Obama into Votes for Romney. Just one more reason…even as I don’t recognize the right of others to dictate my life (by the vote or otherwise), neither would I do the same to others. I recommend you read “The Red Amendment”. I don’t vote and I won’t because doing so is actually an act of treason. See Section 2 of the 14th Amendment. interesting thanks for reading and posting.